I’ve got an exciting update. Rupert Murdoch has been blocked from taking over Sky News. That means he won’t be able to add it to his news empire, and won’t be able to use it to interfere with our democracy. I want to say congratulations to all of us – for helping to stop him. This definitely isn’t what Murdoch wanted. And it proves what we can do when we work together. Murdoch has been using his army of lobbyists to try to get full control of Sky News since 2010. Hundreds of thousands of us came together to stop his bid then – it was one of 38 Degrees’ first campaigns. So when he launched a fresh bid in 2016, we jumped back into action. 71,165 of us then sent in our own responses to the investigation. We all had one message: Murdoch can’t be trusted with more control over our media. In June 2017, Karen Bradley announced an even bigger investigation into the deal. Together we sent 65,283 emails to the watchdog tasked with the second investigation (the CMA). I don’t know what’s going to happen next. Disney might buy Murdoch’s entire company – including Sky. Or another company called Comcast might buy Sky instead. The Murdochs have long been trying to gain a foothold on British broadcasting. We prevented that from happening and members of 38 Degrees were absolutely instrumental in that campaign. We must remain vigilant: they could come back, in time, with a re-launch of Fox News UK. We must never allow it. Murdoch’s a determined operator, and he won’t be at all happy. We shouldn’t assume we’ve heard the last of him. We’ll need to keep an eye out, and be ready to jump into action and stand up for our media and democracy again. But for today, I ‘m proud of what we’ve done. 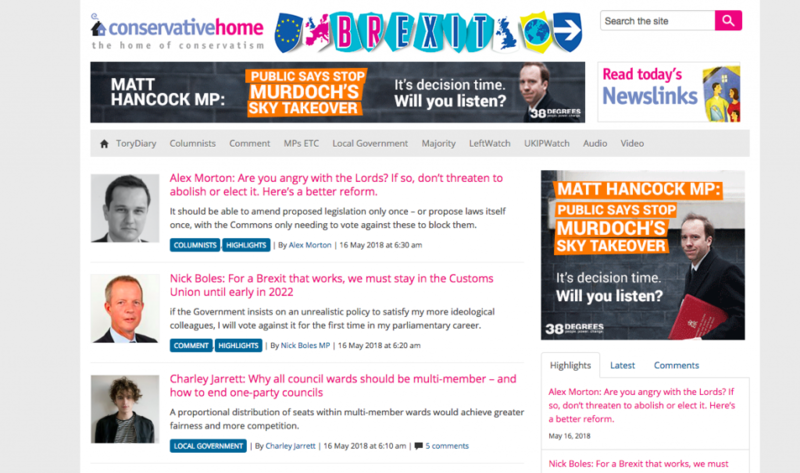 The Mirror: Sky takeover bid by Rupert Murdoch’s 21st Century Fox APPROVED by Tory government: “MPs previously heard the takeover could lead to “increased influence of the Murdoch family trust on public opinion and the UK’s political agenda”. 38 Degrees has been working with the Media Reform Coalition, Avaaz, Hacked Off, Campaign for Press and Broadcasting Freedom, the NUJ, and more to stop Murdoch’s Sky takeover.